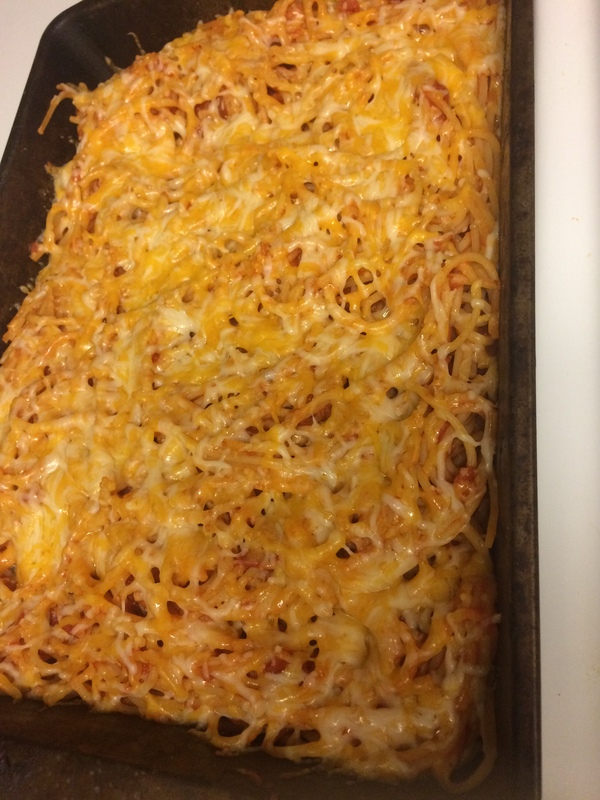 So this is actually barely even a recipe…but more like an amazing idea of a twist to regular spaghetti…and we absolutely love it!!! Start off by boiling spaghetti, but make sure not to cook it all the way through, as you will be baking it as well so it will finish cooking in the oven. You can make your own spaghetti sauce, but I prefer to buy the spicy sauce from a store to make it a quick easy meal. 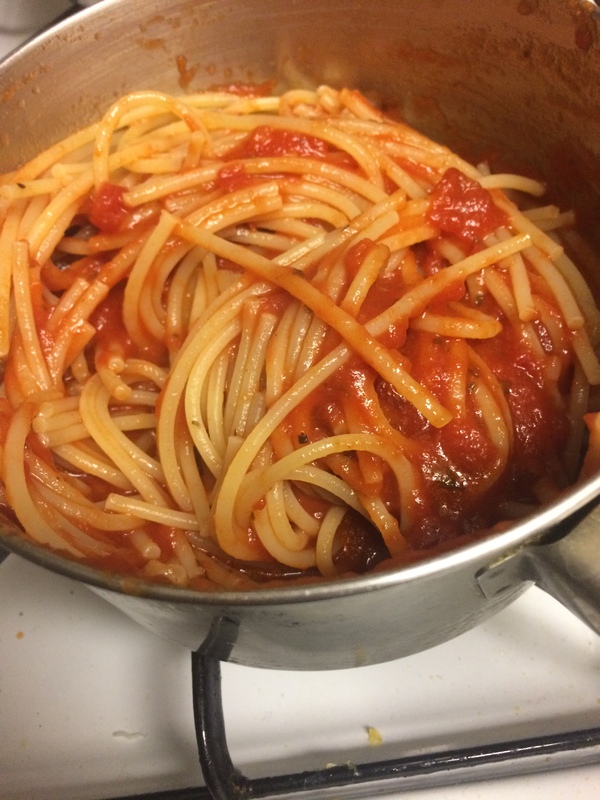 Combine the sauce with the spaghetti and mix together in the same pot, after first draining the water of course! Preheat oven to 375 degrees. Then once that is done, put about 3 tablespoons of melted butter into a pan…this is my secret to make it extra yummy! 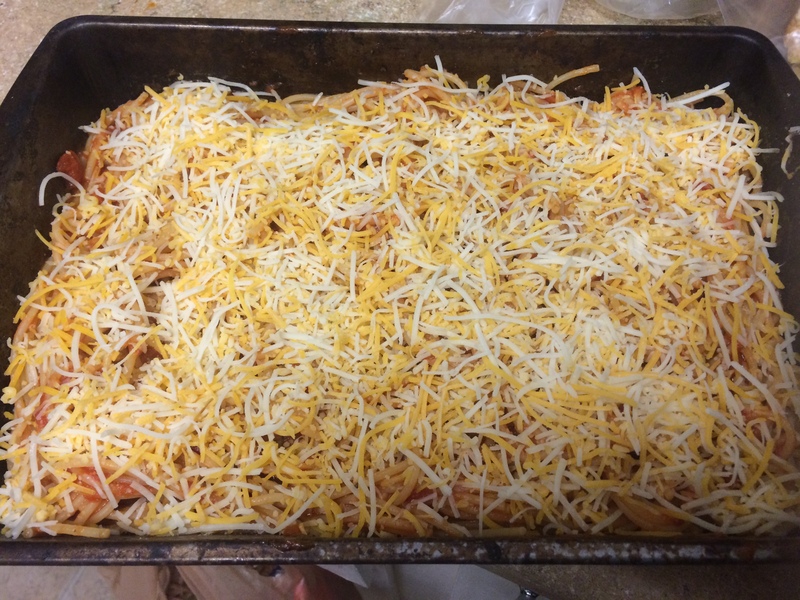 Place the spaghetti in there and spread across to entire pan evenly. Next, and the very best part, pile on all of the cheese!! If you’d like to add chicken or meat, this is the time to usually do it. I usually place it on top of the spaghetti and then put on the cheese if Thomas wants some shredded chicken in there (to keep it healthy). But if you don’t, go ahead with the cheese! Start by using the 1/2 cup of parmesan cheese and sprinkling it all over the top, and then finish off with the 4 cheese Mexican cheese. We love this type of cheese because it adds an extra kick for this dish. Place the yummy pan into the hot oven and let it cook until cheese begins to brown on top, which should take about 10 minutes max…don’t overcook it!! Then you’re all ready to eat! I usually use a knife to cut small squared pieces, to not mess up the entire dish. Enjoy!! Even out all of the spaghetti to keep an even surface. While this is cooking, spread some garlic spread onto 3 or 4 slices of French bread and sprinkle a bit more cheese onto it. After its all cooked, it’s ready to serve! Yum! I can’t wait to make this , (but just using dairy free cheese) !